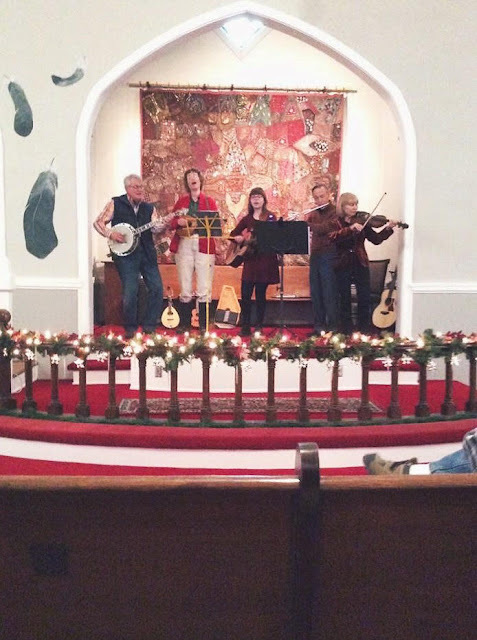 The filk community is a quirky amalgam of generations and attitudes. You'll find a good many senior citizens and middle-aged people, but the newest crop of filkers is coming out of the woodwork. Beware the murderous Millennials. We're taking aim at your french fries, your boredom, and your dubious misconceptions about the youth. Just look at that determined face. 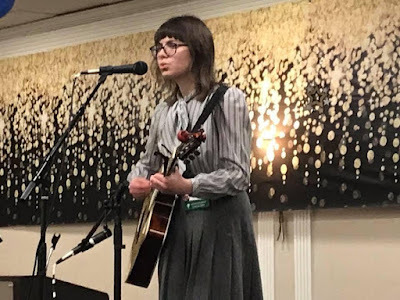 I am privileged to know one of filk's youngest rising stars in person, and she is well worth being a Featured Filker. Today's post is about Lauren Cox. Keeping her composure, despite attempted cat sabotage. 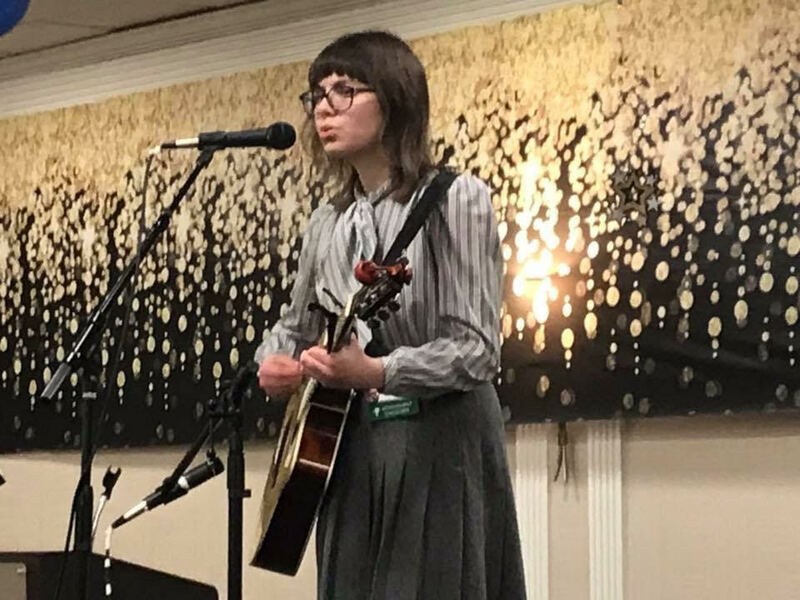 From my perspective, Lauren burst onto the scene in song circles at the Ohio Valley Filk Festival in 2016. But in two short years, she has already had concerts at OVFF, GAFilk, Confluence, and Worldcon 74(!) in Kansas City, also known as MidAmeriCon II. As of last month, she was just selected as the Interfilk Guest for Conflikt 2019, a filk convention in Seattle. She gets around. Primarily in a car, with her friend and veteran filker Cat Faber. As a fellow Tennessean, Cat was the one responsible for Lauren's introduction to the filk community. They still make music together in a local band called Yonder and Back. Here's the whole group, complete with a glorious backdrop. Lauren is an artistic Jill-of-all-trades, with one foot in the visual arts, the other in the journalism world, and both hands deep in the realm of music. Besides graduating in May with her Bachelor's in photography, she also works as a darkroom technician and does graphic design and copy editing for the local newspaper. Yet somehow she has time to also be an up-and-coming singer and songwriter. Oh, did I mention she plays all the instruments? Banjo, mandolin, guitar, ukulele, piano ... autoharp ... marimba. Maybe like this guy. With one more cat. Lauren has switched string instruments four times in one concert before. It's a sight to see. But even with just one instrument, it's wonderful to watch her do her thing. Her classic folky soprano is perfect not only for her original works, such as the song in the first video or this delightful ditty about her hyperactive felines, but also for covering artists like Anaïs Mitchell, Joan Shelley, and others. Here's her take on a song by Kate Wolf, complete with artistic sepia-tone video (as befits someone majoring in visual media). Lauren is working on making her first album a reality. It's an exciting time to be in filk. What more can I say? I only wish someone had captured her performing "Part of This World," her heartfelt tribute to all things filk. It's written to the tune of the similarly-named song from The Little Mermaid. But I'm going to be seeing her at Filk Ontario in a few short months, so maybe that will be remedied sooner rather than later. I am doing the "excellent fingers" as we speak. In the meantime, go check out her other single on Bandcamp, give her Facebook page some love, and come to a filk con. She'll probably be there, and you might find your new favorite song.